Do you guys have badges that identify you as staff? Not yet, but we will. Good thinking - that will definitely help with the fuzzier examples like Wesley College branded shirts. I have observed a wide range of attire across three different institutions. I think the full-time adult employees need to dress appropriately for what they are doing that day. The baseline for most workdays is business casual. Clothing should be upgraded to business formal on certain occasions and downgraded to plain old casual when you are shifting the stacks. because it doesn’t make sense for anyone to ruin their good clothes during a special project (again think major shifting or other physical project in the building). It may be my Gen X mind-set or the fact that I was required to wear a suit and tie for the first three years of my first real job out of college, but I kind of chafe when it comes to set in stone dress codes. I think adult full-time employees should be given the basic parameters to look professional and leave it at that. Students do need a bit more advice, which will ultimately help them transition into their future workplace. I don’t see many teachers, business people, or occupational therapists wearing baggy jeans with their underwear showing or sweatpants while on the clock. I was a student worker at my campus library back when I was in college, and we were not given rules on dress. Looking back, it probably should have been addressed since there were one or two workers who dressed a bit too casually. For the most part though, although we all mostly wore jeans, we all had the smarts enough to wear nice tops and jeans that didn't have holes (although my job actually caused a hole in my jeans- crawling around on the floor shelving books will do that!). I think name tags or badges worn on a lanyard would have increased our "professionalism" and highlighted which of us were staff. Always disliked "Dress for the job you want rather than the job you have" but the punchline to my rebuttal is far too vile for publication. That said, I'm on the slob end of business casual and my general thought on work attire is I dress as well as I'm paid. A nice wardrobe costs quite a bit of money. Dry cleaning costs money; time to get dry cleaning is money. This is in competition with my children - who cost UNBELIEVABLE amounts of money. So I'll dress however I'm asked, within budget. I wear shirts and pants...umm, I don't know what their titles are. Jeans are involved (but I take them out of rotation if frayed), no t-shirts and no sneakers. I think a lot of this comes from my lab background - it's straight up stupid to wear nice clothes around caustic chemicals. 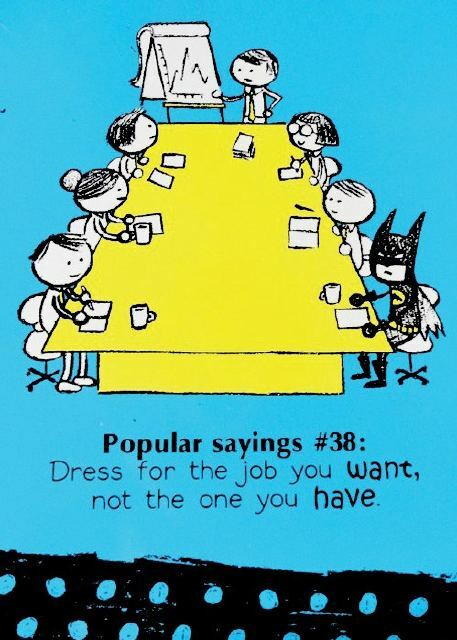 My feelings about professional dress for librarians have become stronger in the last few years. I have stopped wearing jeans to work, and I try to keep my look within the range of business casual. I feel it's important as a younger woman to convey a sense of professionalism to patrons. I know that people don't take me as seriously when I'm dressed in casual clothes at work--I don't like that, but that's the way it is, and I can either work within the reality of my situation and use that to my advantage or I can ignore it because I don't like it and suffer as a result. I've chosen to work with reality. At my current job, we have one student worker, and she always dresses appropriately, but at my previous job, we had a large student staff, and I kept finding myself wishing for guidelines or rules of some sort. I think I would have required real pants (no yoga pants or sweatpants) and prohibited shirts with writing that weren't related to the college. Yes, it's a work-study job, but it's a public service job, and you need to display a certain level of respect for the library and our patrons. Wearing a shirt with beer logos on it does not accomplish that. I view student employment as an opportunity for the student to learn about what it takes to hold down a job with real expectations and consequences, and I don't think we're holding up our end of the bargain as employers if we don't ask them to meet certain standards of dress and conduct. They're doing real work that helps the library run, even if they can study at the desk during down time, and I don't think we can expect good work out of them if we don't make it clear that the job is important.